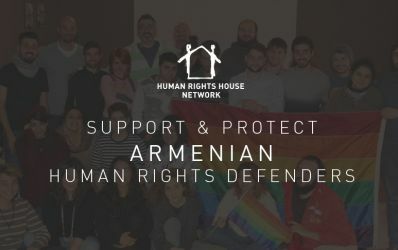 We, the undersigned members and partners of the Human Rights House Network (HRHN), condemn the threats and attacks against human rights defenders in Armenia, and call upon the Armenian authorities to publicly voice their support to such human rights defenders and hold those responsible accountable. On 17 and 18 October 2015, the Armenian NGO Public Information and Need of Knowledge (PINK), a member of the Human Rights House Yerevan, organised the first Armenian LGBT forum, called “Rainbow.” The aim of the forum was to build an LGBT (lesbian, gay, bisexual and transgender) movement in Armenia, discuss problems of LGBT people and together develop a strategy and steps to prevent homophobia and promote human rights for all in Armenia. Around 40 people took part in the event. The forum took place in the province of Lori. Since information about this event was posted, especially on PINK’s Armenia website , the people who are pictured have been targeted in attacks on social media and in offline platforms. These people are being insulted, and threatened to be burnt, and killed. Worryingly, there are also cases of discriminatory statements and hate speech from politicians. We, in this regard, strongly condemn the declarations of the Mayor of Vanadzor, which amount to incitement to violence against participants to the forum and more generally against any LGBT rights defender. The participants to the “Rainbow” forum assembled to discuss and develop means to protect and promote human rights of LGBT people in Armenia, and in doing so, were exercising their right to freedom of assembly. Secondly, no authority in the country has publicly voiced its support to the attacked human rights defenders, in violation of Armenia’s responsibilities to protect human rights defenders. In accordance with Human Rights Council resolution 22/6, as an essential component of ensuring the protection of human rights defenders, States must acknowledge publicly the important and legitimate role of human rights defenders in the promotion of human rights, democracy and the rule of law. This is even more important when such defenders are threatened and attacked. We are concerned that these most recent attacks against participants to the “Rainbow” forum are unfortunately not a unique occurrence. In our letter of 13 September 2013, we alerted the Armenian authorities to attacks against organisations working on gender issues, especially the Women Resource Centre Armenia (WRCA), another member of the Human Rights House Yerevan. WRCA has been victim to concrete threats and the subject of several statements calling for violence, such as “blow up the Women’s Resource Centre”, and ”burn the women’s human rights defenders” for raising gender issues and challenging gender stereotypes in the society. Such public calls inciting to discrimination, hostility and violence are particularly worrying after the firebombing of the DIY bar in May 2012. Although human rights defenders are repeatedly targeted in Armenia, the Armenian authorities remain silent. Through this silence, and by lack of judicial and political action against perpetrators of such acts, the Armenian authorities create an unacceptable climate of impunity for those attacking human rights defenders, in violation of Armenia’s legislation and the State’s obligations under European and international human rights law. At the occasion of the International Day against Homophobia on 17 May 2015, PINK wrote in this regard to all members of the Armenian Parliament, relevant ministries, and the offices of the Prime Minister and the President. PINK called upon the state officials to monitor direct and indirect cases of discrimination on the basis of sexual orientation and gender identity, to ensure the legislative amendments to combat discrimination based on SOGI, thus ensuring equal rights and respect towards LGBT people and protecting them from the kind of acts described herein. PINK only received answers from the Ministry of Health and the Ministry of Justice, but none from any of the MPs it addressed. The Republic of Armenia has committed itself internationally to protect, empower and support human rights defenders by co-sponsoring the resolutions on the protection of human rights defenders at the United Nations General Assembly and the Human Rights Council. Ensure that various political leaders publicly express support to threatened human rights defenders and denounce such threats and attacks, including in support of the participants of the “Rainbow” forum, and thereby affirm the legitimacy of their work. The Human Rights House Network (HRHN) is a community of human rights defenders working for more than 100 independent organisations operating in 16 Human Rights Houses in 13 countries. Empowering, supporting and protecting human rights defenders, the Network members unite their voices to promote the universal freedoms of assembly, organisation and expression and the right to be a human rights defender. Human Rights House Yerevan unites 11 organisations working in various fields related to human rights protection aiming to create “one access door” services for the beneficiaries and by this eliminate the difficulties that citizens may face for getting support and services for their human rights protection. HRH Yerevan was registered in Armenia in 2014 and became an HRHN associated member in 2012. It will serve also as a platform for different civil society organisations, movements and civic initiatives to join the effort and empower human rights protection in Armenia. The Human Rights House Foundation (HRHF), based in Oslo with an office in Geneva, is HRHN’s secretariat. HRHF is international partner of the South Caucasus Network of Human Rights Defenders. HRHF has consultative status with the United Nations and HRHN has participatory status with the Council of Europe.